You want to access common system variables such as ‘%appdata%’ or ‘%windir%’ just like in Explorer for personalized scripts created with Windows PowerShell. In PowerShell, you can easily access all system variables and use them in scripts. The scripts thus become more independent from the actual installation and can be transferred to another computer easily. Moreover, you can also request and use particular system information such as processor specifications. 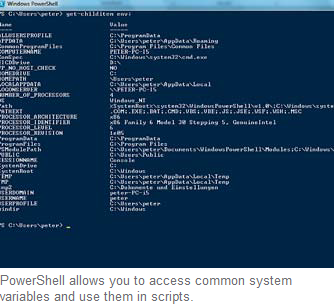 The environment variables are present in the ‘Env:’ section of PowerShell. You will thus get a complete list of all the existing system variables with their respective values with the command get-childitem env:. Individual values out of these can be referred to in the form ‘$env:windir’ so that access via the prefixed drive specification is possible even from other locations. You can get to know the methods and properties available for such an object with the command get-childitem env: | get-member. However to list the actual properties of a particular entry, use the command ‘get-item env:windir | format-list – property*. This command loads the ‘windir’ variable as object and transfers it to the command after the pipe icon for list release of all properties. Use the command let ‘rename-item’ in the form rename-item env:tmp –newname tmp2 to rename an environment variable. You can also easily change the content with the help of ‘Set-item’ and the parameter ‘-value’. For example, redefine the temporary folder with ‘set-item env:TMP –value ‘C:\Daten\Temp’’. The functions can thus be combined. Read out the path variable in the system and add it to the folder ‘C:\ Test’ using ‘set-item env:path -value (getcontent env:path+’;C:\Test’). ATTENTION: Changes to the environment variables are applicable only for the current session. Permanent settings need to be configured in the profile of PowerShell or in the system. However you can still change or rename the predefined system variables if you know the exact effect of your action.